Unattended and un-kept attic and crawl spaces are home to a spectrum of problems. Unfortunately, the presence of infestations often goes unnoticed to naked human eye and issues become apparent only when the damage gets out of hand. In this scenario, homeowners may need to spend big amounts of money and even evacuate the property in order to get it back in proper condition. Periodic assessment, proper maintenance and appropriate upgrading, can help in keeping the attic and crawl spaces clean, hygienic and healthy. They also add to the longstanding of the property. We, at Quartz Solutions, are equipped with advanced technology and experienced work force that provide customized and hassle free monitoring, prevention and enhancement services for your attic and crawl spaces. If the presence of infestations is ignored and left unattended, their existence may soon wreck havoc around the property. Financial and long-term health implications are a real threat, and the overall damage may be extensive. Dripping ducts make attic and crawl spaces damp and smelly. Mold and mildew find these conditions perfect to breed. 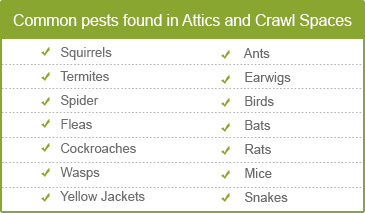 Insects like wasps and roaches spread harmful diseases. Pests and termites cause severe wood rot and damage the basic structure of property. Animals like rats and mice nibble away and damage ducts, wires and much more. Leaking air ducts may let harmful gases flow into living areas and put the entire family at risk. 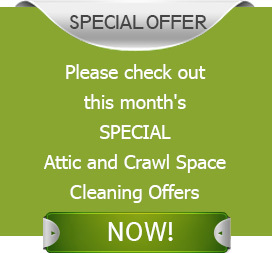 Clean and well-kept attic and crawl spaces mean healthy, hygienic living area for you and your loved ones. A careful inspection goes a long way in maintaining your property. Our team of experts carries out the most comprehensive assessment of your premises without charging a single cent. Depending upon the requirements, the most appropriate plan at the most reasonable price is chalked out to clear any problems. We, at Quartz Solutions, strive to provide premium attic and crawl space services that are perfectly designed to handle your individual needs. Needless to say, our services are reasonably priced with no hidden cost. Situated across the Hudson River, Fort Lee is a small borough in Bergen County, NJ. Home to nearly 35,000 people, Fort Lee is known for its beautiful homes, apartments and office structures. Hire us to help you maintain a clean and hygienic environment for you and your family. Our dedicated attic and crawl space services will help you keep your property’s value for years to come. Call Quartz Solutions 201-205-2042 to avail a complementary inspection and a first class service.